Our role in helping support local businesses. We pride ourselves on providing a local, community driven service. 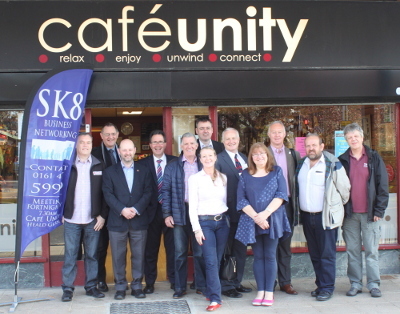 Out & About Carpets are a proud member of the SK8 Networking Group. The group is based in Heald Green, Stockport and we meet at Cafe Unity once a fortnight. Being part of a local business networking group means that we can share some great ideas and meet other business leaders. This helps to improve our company, as well meet some great contacts. As a group we are all willing to turn to one another for services as well as support. As an active member of the group we have also helped out in the local Stockport community. We have been getting ourselves amongst it and lending a hand wherever needed. We have even put our gardening skills into good use! How we have helped local businesses. As a member of the group, we have recently worked closely within it to help our own business. I’ve recently purchased some new uniform and had it embroidered with my redesigned logo. I have also had new racking supplied and fitted for my lock-up. All these services were completed to a high standard by members of the group. I also use their local accountant. For the public, if you are using companies attached to these types of groups then you can benefit from a referral network of tried and tested professionals. I am happy to refer fellow group members as needed. I regularly receive referrals from other members who have confidently recommended me. As a member I have to uphold the reputation of the group by maintaining professional standards of service and good value. This instills confidence for the end user and is a further re-assurance of quality and services I offer. If you would like to find out more about the SK8 Networking Group for your business or for someone else’s business. Call 0161 437 5999 for more information.